Kung hei fat choy! Happy New Year of the Horse! We are galloping along with preparations for the exhibition China: Throne of Emperors which will open in the Visa gallery on the 22nd of March. 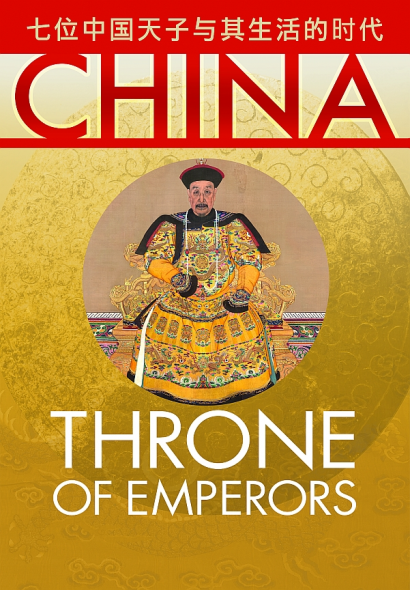 Throne of Emperors: coming soon to Te Papa! 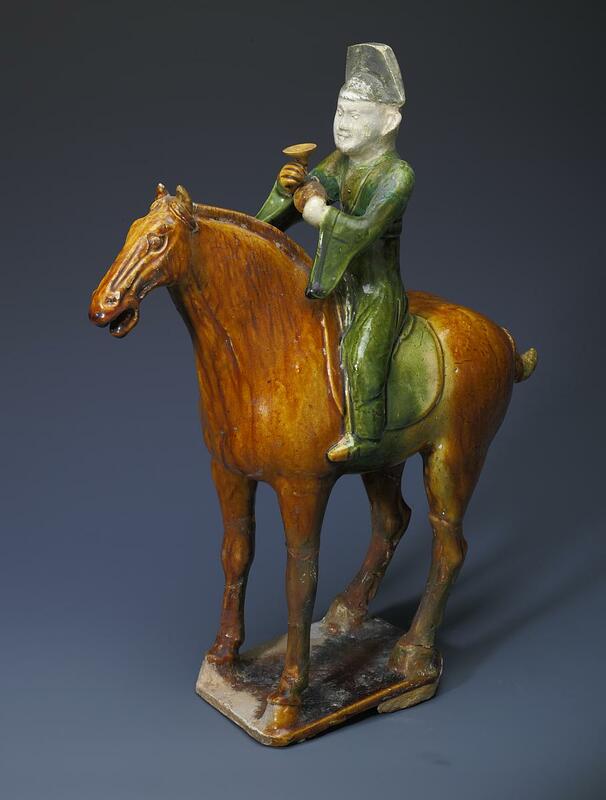 In addition to more than 150 ceramic, jade, metalwork and textile objects spanning a 2000 year period of China’s history, the exhibition will include six items from Te Papa’s collections. 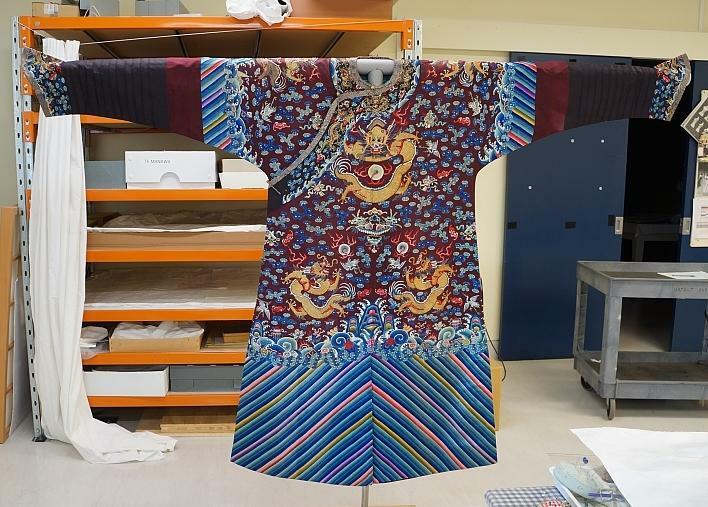 One of these Te Papa objects, a late 19th century Qing Dynasty silk ji fu, or dragon robe, needed to undergo conservation treatment so that it could be safely displayed. 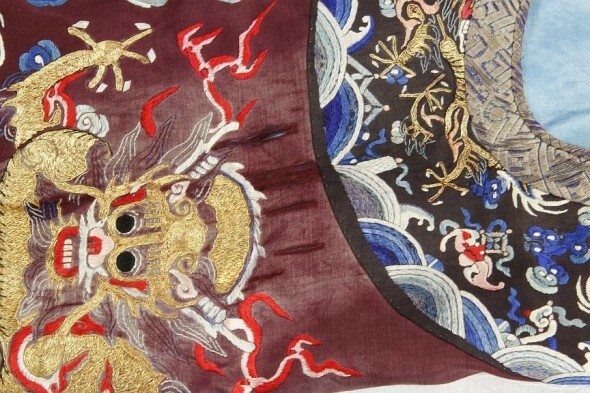 The dragon robe, or court robe, is a garment that was introduced by the Manchu people when they ruled China during the Qing Dynasty 1644-1912. Only men who were civil or military officials were permitted to wear them (and the women and children in their households). Many museums around the world have examples in their collections in a variety of colours–the colour being indicative of the official’s rank. However, both the shape and decoration of the robe are fairly consistent from one robe to the next, because this was regulated by strict guidelines published by the Qianglong Emperor in 1766. The nomadic lifestyle of the Manchu people is largely responsible for the tailoring of the garment. Vents, or slits, at the front, back and sides accomodated horse riding. The peculiar sleeve cuffs are referred to as “horsehoof cuffs” because of their shape. 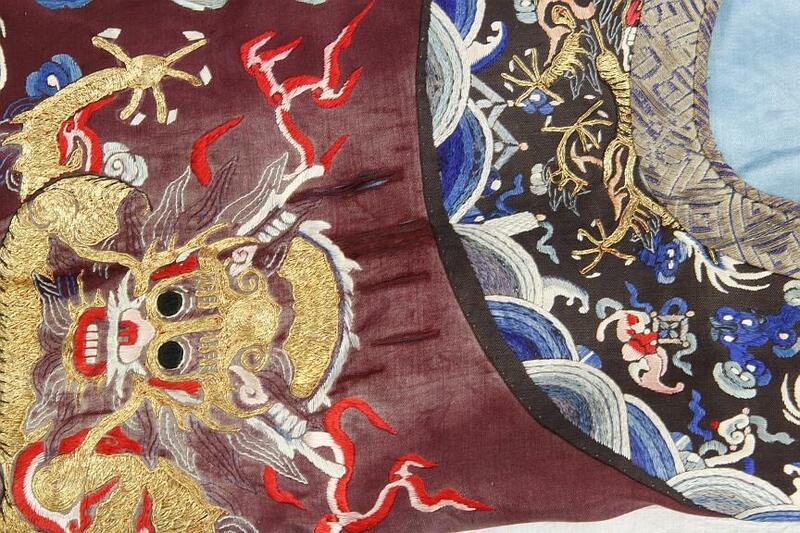 The way the surface of the dragon robe is adorned is linked to Manchu beliefs about the world. According to Asian textile scholar John Vollmer, the design on the court robe represents a kind of diagram of the universe. Water is represented at the hem by multicoloured embroidered waves; rocks jut out of the water and clouds float in the “sky” around the torso and sleeves. The position of the wearer’s head implicates them as the center of this universe, with the head in the spirit world and the body in the material world. 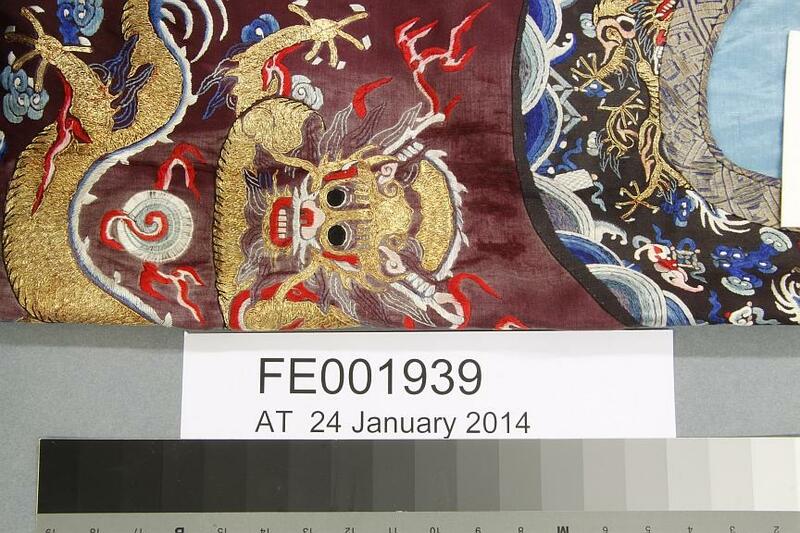 Te Papa’s dragon robe is generally in good condition, but the silk along the top of the shoulders is faded and weak because of too much exposure to light at some point in the past (prior to its acquisition). Splits have started to develop here, because when the robe lies flat in its storage drawer, there is a prominent fold at the top of the shoulder. The damaged silk was stabilised by custom dyeing new silk to match, and inserting the dyed silk beneath the splits. Hairsilk, or silk thread from the cocoon of the silkworm (actually thinner than the hairs on my head–I checked) was used to stitch the weak areas to the stronger dyed patch supports. This treatment has enabled the garment to be displayed in the exhibition for three months, and we have just done a “test fit” on the display mount to ensure all is headed in the right direction for next month’s opening. The robe will be displayed alongside other embroidered textiles and jewellry from our collection. Visit us during the exhibition to see the robe on display alongside many other treasures from the National Museum of China and to learn more about China’s imperial dynasties. For a visual overview of Qing Dynasty costume check out this Pinterest board: http://www.pinterest.com/ralphrepo/qing-dynasty-dress-and-costumes/ A great source for detailed, in depth information is John Vollmer’s excellent book Ruling From the Dragon Throne: Costume of the Qing Dynasty (1644-1911) [Ten Speed Press, 2001].